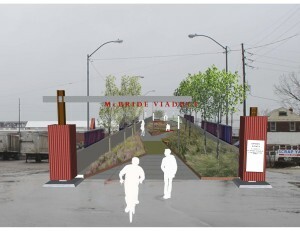 On Saturday, January 25 at 3PM, CIVITAS is hosting a 40-­‐minute presentation (with architect Adam Trott, landscape architect Michael Beightol, urban critic Stephen Sonnenberg and social sculptor Lisa Austin) on their proposal to re-­‐purpose the McBride Viaduct into an urban park and pedestrian transit route. Free and open to the public, the presentation will be held six blocks North of the Viaduct at Poet’s Hall, 1136 East Lake Road, Erie, PA.
Named for a beloved pastor, the McBride Viaduct was built, in part, to allow “safe passage” for children walking from their homes South of the tracks to their school a few blocks North. Closed to vehicular traffic since 2010 (due to stability concerns) the 1,170 foot long Viaduct still provides a vital service as a pedestrian and bike bridge connecting East 12th and East 19th Streets over the busy CSX and Norfolk Southern rail tracks. Since the construction of the Viaduct almost eighty years ago, contemporary infrastructure work has carved up and isolated some neighborhoods, inadvertently harming the Eastside. While logistically sound, the plans to divert pedestrians from the Viaduct to the utilitarian Eastbay Connector overlook the unpleasantness of a daily walk along a busy highway lined with sound barriers instead of enjoying a stroll on sidewalks of neighborhood streets and a human-­‐scaled viaduct. During the January 25th presentation, site plans and drawings will be presented. If the community supports the proposal to re-­‐purpose the Viaduct, the immediate goal will be to gain the ear of elected leaders and Penn DOT administrators. The structure must be immediately stabilized, water drainage must be improved, and lights and security cameras must be installed. Two landscaped entrances will be established. Additional plans to complete the Viaduct park will evolve organically as businesses and neighborhoods linked to the Viaduct become involved in the project. Organizations including neighborhood businesses, churches and watch groups, the Lake Erie Regional Conservancy, the Erie Art Museum, Bike Erie, Voices for Independence, Penn State Master Gardeners and the Society for Industrial Archeology are potential partners in this project. High Line Park, on abandoned 1930 elevated rail line 7,655 feet long, NY, NY (1999). About the team: Erie architect Adam J. Trott heads a full service architectural design firm (www.ajtarch.com.) Cleveland landscape architect Micheal Beightol, Erie urban critic Stephen Sonnenberg and social sculptor Lisa Austin are members of the Civitas collaborative. Civitas (Back to Erie, Inc. http://www.civitaserie.com) was formed in 2004 with a mission of creatively advocating for Greater Erie. Civitas cofounded All Aboard Erie (transportation advocacy http://www.allaboarderie.com), Innovation Erie (product design competition http://www.InnovationErie.net), Preservation Erie (www.ErieCDP.org) and has sponsored dozens of speakers and events including the Green Friday Made in Erie Marketplace. The Mercyhurst University History Department is proud to announce that Erie Places, Erie Stories – a student-produced photographic and oral history exhibition showcasing Erie’s historic structures – is moving to Erie City Hall, opening with a reception free and open to the public on Wednesday, January 15 from 5:30 – 6:45 pm, preceding a regularly scheduled Erie City Council meeting. Funded by a grant from Arts Erie, Erie Places, Erie Stories will be located in the first floor foyer of Erie City Hall and will be accessible to the public during regular business hours of 8:30-4:30 through Friday, February 7. Completed by Mercyhurst public history students as a semester-long hands-on learning initiative, the exhibit “makes a compelling case for more fully appreciating and protecting the historic built landscape of a great city,” said Dr. Chris Magoc, Chair of the Mercyhurst History Department. The exhibition of more than 30 photographs premiered in December at Stairways Bloom Collaborative and now features an interactive element whereby visitors will be invited to write down their own special “Erie Place That Matters,” adding to a list compiled by Preservation Erie, one of the community partners in the project. The exhibit will also allow visitors to purchase the photographs, with proceeds going to an organization in the neighborhood where the images were taken or to Preservation Erie. For more information on the exhibit, contact Chris Magoc, Ph.D., at 824-2075.